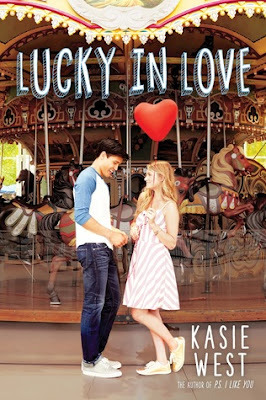 I was really looking forward to reading Lucky in Love by Kasie West, as I’ve pretty much adored all of her previous books, and I was super curious to see how this one would compare. Needless to say, I loved it, just as I knew I would, and it’s definitely going on my list of books to re-read again soon! There are a lot of characters to like in this book, including Maddie, the main character. I found myself relating to her in more than one way, except for the winning the lottery parts. (I would LOVE to know how that feels though!) I love her determination throughout the story, and am definitely envious that she knew what she wanted from her future, and was willing to do what she had to to get it. She has some great friends, though they do go through some trials throughout the story. I have to say that Seth was my favorite character in the story though. While others seemed fake, he didn’t, and I definitely appreciated that. The storyline for the book revolves around Maddie winning the lottery, and the effects of that. This is the second book I’ve read this year that’s about a character winning the lottery, and I have to say that it really is fascinating to see how different viewpoints on the storyline. I can only imagine what people who win the lottery go through, so seeing it from someone else’s point of view is interesting. And, of course, the romance in the book is sweet, as it is in all of Kasie’s books that I’ve read so far. I think I enjoy that the most. *grin*. Also, I listened to the audiobook for Lucky in Love, and I think the narrator, Laurence Bouvard, did a great job with the voices! I will definitely be checking out more audiobooks narrated by her soon. Overall; Lucky in Love is another great addition to Kasie West’s growing collection!! I can never get enough of her books, so it’s probably a good thing that she’s a writing machine. I just picked another of her upcoming releases for my *Waiting on Wednesday* pick recently, and I’m super excited to check it out as well! I would like to get my hands on this one. It sounds so good. Great review! I also would like to know what it is like to be a lottery winner. It's funny you pointed it out, but I felt like West has been writing a lot of books lately too, which makes me happy, because her books make me happy. I love Kasie West's books! They're always so sweet and the romances are typically swoon-worthy. Glad to know this was another great book!